NETWORK UPDATE: AMERICA’S GOT TALENT gained 0.1 in final numbers, and HOLLYWOOD GAME NIGHT lost the same. CABLE HIGHLIGHTS: OWN’s THE HAVES AND HAVE NOTS took the night, up 0.05 from last week. Right behind was ESPN’s coverage of the high-profile Williams sisters match at the US OPEN at 0.95. Spike aired a INK MASTER double feature, with the first hour up 0.04 to 0.86 and the 2d hour at 0.61. 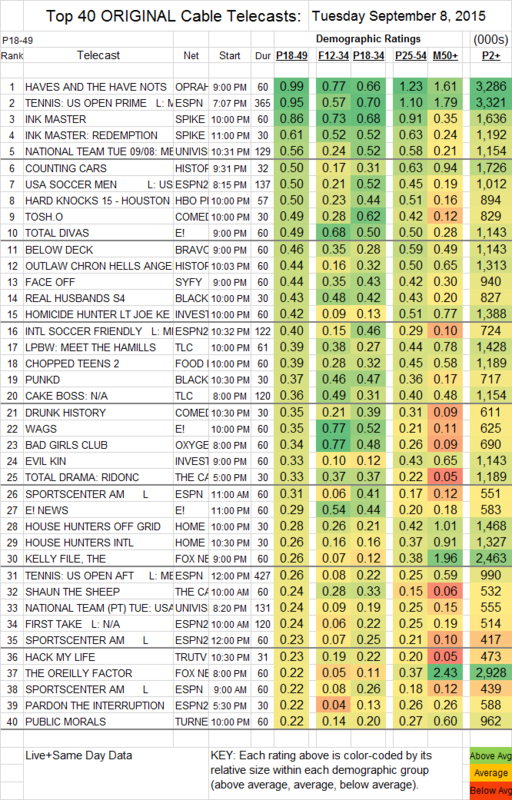 There were a pair of soccer telecasts in the Top 10, Univision’s at 0.56 and ESPN2’s at 0.50. Football also scored with 0.50 for HBO’s HARD KNOCKS. History’s COUNTING CARS dropped 0.11 to 0.50, while OUTLAW CHRONICLES rose 0.03 to 0.44. On Comedy Central, TOSH.0 lost 0.06 to 0.49, and DRUNK HISTORY gained 0.02 to 0.35. E!’s TOTAL DIVAS held at 0.49, with WAGS down 0.04 to 0.35. Bravo’s BELOW DECK ticked down to 0.46. FACE OFF (Syfy) gained 0.09 to 0.44. BET’s REAL HUSBANDS grew by 0.06 to 0.43, and PUNKD by 0.08 to 0.37. PUBLIC MORALS (TNT) continued sliding, down 0.03 to 0.22. The 2-episode season finale of USA’s PLAYING HOUSE was down 0.02 to 0.21 in the 1st half-hour, then at 0.16 in the 2d. On ABCFamily, MONICA THE MEDIUM eased by 0.02 to 0.17, and NEXT STEP REALTY lost 0.02 to 0.07 (152K total viewers). BIG BROTHER AFTER DARK (POP) was at 0.06/124K.